I’ll start with some common comments on recent student evaluations for the last two times I’ve taught the course (Fall 2015 and Spring 2017). Some want a chance to rewrite essays (which I have given sometimes in courses but didn’t this last term); we do peer feedback on essays, and students wanted to rewrite the essays after getting the feedback. I have given that option before and will again! For the last two bullet points, I do give a fair bit of information on writing–see here. Still, I think that such things can get overwhelming and don’t really mean that much until one actually starts writing and getting feedback. Then the instructions start to hit home more. Thus the need for more chances to write and rewrite. Of course, we are limited in our time and TA hours for marking essays, which is a bit of a problem sometimes. I have up to 150 students in this course, and marking and giving feedback on essays takes a great deal of time! Thus the peer feedback exercise, so they get more feedback. I have rarely been satisfied with what I do during class time. It’s such a precious few hours in a term and I feel like one should focus on things that it makes sense to do when we’re in a room together, rather than on things that could be done online or in other ways. That means it should be things that require that we work together somehow, not me just standing there talking. Yet, that’s mostly what I do and I’m frustrated with myself for it. Of course, many, many students think the lectures are what taught them the most (see above), so I’m also torn. Still, I could do the same things with videos, right? I mean, at least with parts of the lectures…the videos wouldn’t be as interactive as the lectures are, since I intersperse the latter (on days when I’ve planned well) with questions on Learning Catalytics or activities on Google Docs or other things. This is related to the above; I too often, I think, do for students what I should be asking them to puzzle through in order to learn. I say that philosophy is not about memorizing things about philosophers’ views and I believe it, but sometimes what I do in class operates on that model. I explain the philosophers’ view for them. So what are they supposed to do with that? Memorize it and answer questions on the exam? Well, a bit more than that–they are also supposed to take those ideas and apply them to something else, compare them with other views, come up with questions or possible objections about them, etc. Still, I often operate, during class time, as if my role is to provide content knowledge from the expert perspective and theirs is to take it in. If students are just fed the information, they won’t necessarily feel the need for it themselves; they just take it in because I tell them to rather than because they have an internal sense that they want it or need it for something. In Ambrose et al., How Learning Works: 7 Research-Based Principles for Smart Teaching they note that “students’ motivation generates, directs, and sustains what they do to learn,” and that students need to see a learning goal as both subjectively valuable and also attainable (p. 69). Active learning, in which students are doing something rather than sitting passively, is more effective for learning. I act as a model for students when I give them the overview of each view, but then also expect them to be able to do this on their own when they leave the class; they need practice to do what I am giving them in lectures. In relation to students’ concerns noted above with there being a lot of reading, I really want to help students practice doing reading of philosophical arguments (whether in classically “philosophy” texts or elsewhere) and honing their abilities to analyze and criticize those arguments. That’s so important to carry over into other aspects of their lives–there are philosophical arguments everywhere, and being able to parse them and question/criticize them well is an important life skill I believe. I have thought in the past about spending time on reading and taking effective notes on readings, finding arguments and outlining them, etc. I’ve done the latter in this course but not the former (how to read, how to take notes has been left behind). This time I really want to include that. I am not happy with any of the themes I’ve used for this course. It’s an introduction to Philosophy course, but it’s focused on “value theory” (roughly: ethics, social & political philosophy, aesthetics…or any one or two of these). It is not required for majors, and most students who take it won’t go on to take any other philosophy course. So the point is not to make sure they get any particular content, but, from how I think of the class, the content should be a vehicle to teach skills like careful reading, analyzing and criticizing arguments, formulating one’s own arguments, writing, respectful discussion, etc.–things that will be useful in their lives more generally. 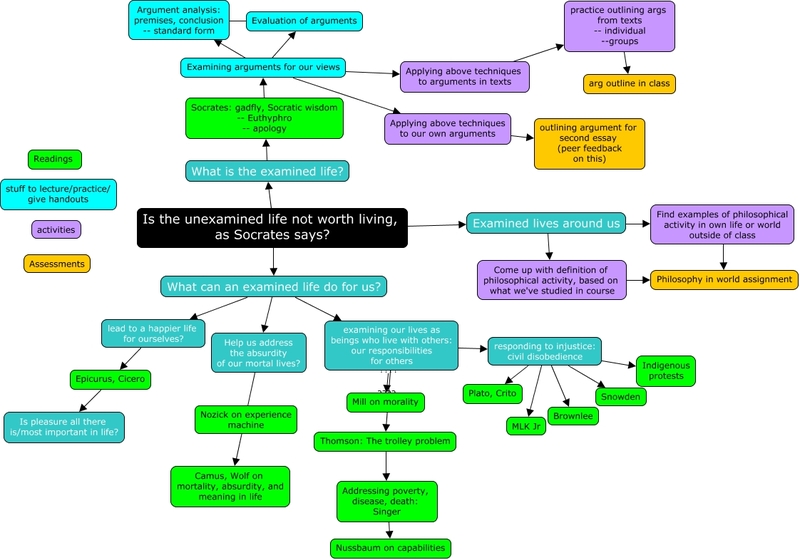 Is the unexamined life not worth living? What is the examined life and what of value is it? This was even more nebulous than the second one in this list. I worked really hard to have it work around a single main idea, as you could see in this mind map; but it just didn’t work out. What I am thinking right now is that the course should have some “applied” topics (a few students said they liked those better than the more theoretical discussions), and that everything should fit together into a somewhat coherent whole (some students got a bit frustrated in the Spring 2017 course about this, and I did too). I’m out of time and so finishing this off even though there are probably other things I could add to the section on what I think should be improved. So I’ll end with a few notes to myself. More to come on all this…I’ll be doing planning of this course in the open as I often do! I apologize in advance for interrupting your self-reflection process. But, as a student, I have taken a few introductory first year classes that have used video lecturing. 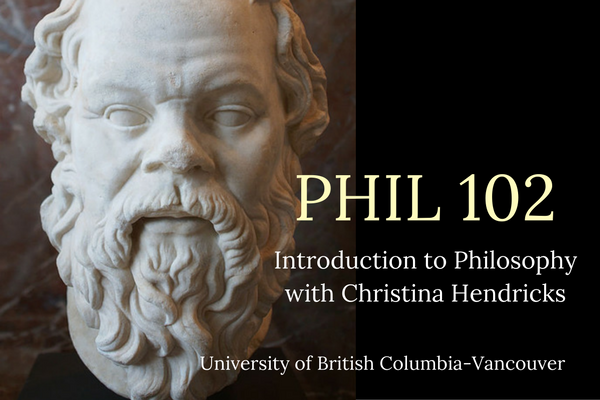 I felt that it might be worthwhile to share some of my thoughts on what worked and how these ideas might be applied to PHIL 102. You may, of course, choose to take some of these points into consideration or to ignore them entirely. One course that I’ve taken that uses video lecturing in a very effective manner is CPSC 110. A link to the course for students interested in the course material/writing the challenge exam can be accessed here, but you may need to use your CWL to access the course material: https://edge.edx.org/courses/course-v1:UBC+CPSC110+2017S (please let me know if you can’t login and I’ll see if I can arrange something else). By using video lectures, CPSC 110 is able to cover way more material than would otherwise be possible. To ensure that students are understanding the material they are watching, the instructor will often start each class by asking students to answer basic questions using an iClicker poll or by giving students a short 5 minute warm-up problem to work on. In the later case, the lecture TAs will walk around the room and help answer student questions. If quite a few students are stuck on a certain part of the problem, the instructor will often get the class to convene and will provide further explanation on the area(s) students is/are struggling with. As students have already received a lecture on the material, the rest of the class is largely spent with the instructor and students working on examples together. Perhaps, you could use videos in PHIL 102 in a similar manner. For instance, you could make a lecture video on how to read a philosophical text or analyze an argument, as the methods for effectively doing such probably doesn’t really change from year to year. In this video, you could walk through the methods that you use to read and analyze philosophical writing and then demonstrate how to apply these methods by going through a short passage. In class, you could then ask students to take a few minutes to analyze an excerpt from a text and write down some of their thoughts. Students could then be invited to share their ideas with their neighbours or to help walk you through an analysis of the example passage. Following this, you could provide them with the standard interpretation of the passage. By doing this, students may learn how to analyze arguments and come up with interpretations on their own. Students may even come to realize that, although there are good reasons to support your interpretation of the text, that there are also good reasons to support their own interpretations. It might also be worthwhile to note that, in all courses that have used video lectures, I’ve always enjoyed being able to stop, start, rewind, and replay the lecture. This way, I can go through the lecture at my own pace, take notes, and even rewatch parts that I find confusing. Thus, the use of video lectures might allow you to retain the lecture part of the course (which you mentioned students found very helpful), while also giving you the time to integrate more student activities into class time. Sorry for the really long comment! No need to apologize–I love getting comments on my self-reflections, which is why I put them on my blog! It is really, really helpful to have some thoughts from a student perspective. I love your idea for using videos in 102. I think the method you suggest makes a lot of sense: create videos on things that won’t change a lot from year to year and then have students apply things in the video during class. I was also thinking of saving a little time in class by making a few videos that give context to readings that I use from year to year. For example, I teach Plato and Socrates a lot, and if I made a video giving some historical context to make the readings easier to understand, then students could probably do better with the readings than just going into them “cold.” Plus, it would save me having to do it in class. One thing I want to be careful about, though, is to not pile too much more onto students outside of class. Making and assigning videos means more time in class for other things, but it can also mean you’re asking students to do outside of class what you were doing inside (in lectures), and adding that on TOP of the same amount of reading. So you’re adding more work to what was there before. This is not a problem if the videos are short and there aren’t too many of them, but it’s something I want always to keep in mind. The idea of spending more time in class on applied things, or students doing other activities, really sounds right to me from a pedagogical (and student engagement) standpoint. I will probably take your idea on a video about analyzing arguments and use it my class next year, and also as inspiration for similar kinds of “skills” videos. Thank you! A comment by Alex Enkerli–the commenting system ate it so he sent it to me via email and gave me permission to post it here! Your reflexive approach is very appropriate. The very fact that you’re thinking about all this and sharing it publicly ties in quite well with your material. You want students to take the risk of thinking deeply about philosophical notions through a connection with some practical matters. Sounds like what you’re doing here. Overall, it sounds like you’re “ready for the Mazur treatment”. Ok, ok, this could sound like a pitch for the kind of teacher self-help book that you find in some parts of our sphere of agency. But it’s quite striking that what you describe as wins and challenges can go really well to what Mazur has been doing in terms of Peer Instruction. Perhaps the videos are the most obvious part, since the “Flipped Classroom” has been transformed into a strategy to develop high-quality recorded content. But my sense of your connection with Peer Instruction came while reading the beginning of your post, before you mentioned videos. As you say, class time is precious. As learners tell you, you do well in lecturing. But you also say that they need time to process things, wrestle with complex ideas, come up with their own answers, “do the thinking”. A key insight, described as an obvious thing in a T&L workshop by the theatre teacher who later became my coach: learners learn during pauses. So, having a bit more of the lecture content be prerecorded will allow you to spend a bit more of that precious class time on allowing learners to hash it out. Fairly well understood as a flipped classroom idea. But the idea is also about connecting these videos with action. Mazur uses a fairly specific method, with very clear follow up questions. But he teaches physics. His questions could work well with philosophy, but they need to be embedded in something. To me, a key is in prepping learners for what is coming up. Before they watch a video or work through a reading, they can get a pretty good idea of what they’re getting into. For texts, it goes really well with the “skim then focus” method everyone uses in grad school and undergrads could really use early in their careers. For videos, it’s more about getting into the right mindset, though it could also make sense with a system in which they can annotate the videos themselves and/or go back to specific sections (if they’re on the long side; typically the advice is to chunk up videos into very short segments). The Peer Instruction model goes further, though. It’s also about the “jigsaw” (where each learner holds a piece of a broader puzzle, becoming the local expert of some part of the material). And all sorts of group exercises which actually work really well in larger classes. Something which has worked really well for me in intro courses is to have students take automatically-grade quizzes online before coming to class (at least 24 hours in advance). When working on common topic, it’s easy to gather fairly large banks of appropriate questions. Checking quiz results and identifying a few key issues which require further discussion, it’s been remarkably easy to focus my precious class time on those topics and concepts which really require everyone’s attention. Because my usual technique is to ask learners to explain the material together, it really works well. Much of it, in my case, has been about defining key concepts. Someone will come up with a working definition and work it through until most people are satisfied that they do understand the concept enough to recognize it when it comes up and use it in their work. As for the length of readings, it sounds like something any philosophy teacher will get as a comment. Pretty rare to say that philosophical texts are too concise, too straightforward, or too easy to understand (unless the person is posturing). A key comment was given to me in one course evaluation: there were too many texts for the type of work we did with them. That clued me in. Then started shortening my lists of texts in most courses, making sure that we could give each text its due. At the same time, kept insisting that learners focus on certain aspects of each text. In a small class, this is fairly easy to do with critical responses. But even in large classes, having each learner share something in a forum (which is then peer-rated, as can be done in many online spaces) really has a big impact. One person got something from the text that nobody else got, and others may latch onto that. Others are simply practicing their active reading skills. Those who are “too shy to speak up” get a chance to share some thoughts. The key is for everyone to remain non-judgmental but, based on your attitude here, it sounds like it should be easy for you. In all of this, a key may be to treat students as allies in a learning process. At any rate, these are just a few thoughts. Sure, some of them have to do with the use of online tools (my technopedagogical background is about making sure technology isn’t an obstacle to learning). But the specific tools don’t matter much. Any LMS would do, and the post-LMS idea could be quite cool (though it requires a bit of tech prep). 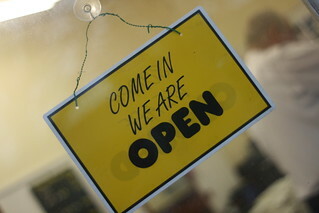 Even just using a course-private blogging system could work well without much effort. And given UBC’s trailblazing projects in Open Badges, a couple of years ago, it could make for a really neat approach to the recognition of learners’ competencies. Not to gamify the course, quite the contrary. To enhance the metacognitive aspect of the learning and encourage the side of peer-assessment that even David Hinchey would recognize as useful. Oh, and obviously… Debates tend to work really well when hashing out ethical issues. And, yes, it can work with large classes, given an appropriate setup.